Gene Autry (Gene Autry) opposes the drilling of a nearby oil well, fearing it will endanger the cattle's drinking water. Doris Maxwell (Judith Allen), daughter of the town banker, is his greatest opponent, and she is waging a stock-selling campaign over her radio station, seeking backing for the oil-drilling promotion. Her father , (Mr. Maxwell (William Farnum), has invested the bank's funds in the oil company. However, she and Gene become friends when he prevents a holdup of the oil company payroll. George Wilkins (Weldon Heyburn), in charge of production at the well, engineered the holdup as he knows that unless the well comes in, the company will lose the lease and he can secure it for himself. Gene and Doris return to town and arrive at the bank just as her father shoots himself. Gene, covering up the fact the Maxwell has misappropriated the bank's funds, makes it appear he was shot in a bank robbery. Learning that the railroad will run a branch line into the valley is oil is found, Gene withdraws his opposition to the project, and convinces the ranchers of the value of a railhead , and sells many shares of stock. Wilkins spreads word that the well is dry and that Gene has taken advantage of the ranchers. Gene escapes from a posse and leads then to the drilling site where Wilkins and his henchmen have persuaded the workers to stop drilling. Just as Gene is ready to blow in the well with dynamite, Wilkins arrives with the posse, which is convinced that Gene shot Maxwell and stole the bank's money. Doris proves otherwise and Wilkins attempts a get-away. Maxwell is trying to bring in an oil well and Wilkens is out to stop him. When his attempted robbery of Maxwell's payroll fails, he tells the ranchers who invested on Autry's advise that the well is dry. But Gene knows there is oil there and with everyone after him he heads for the well to try and bring it in with dynamite. 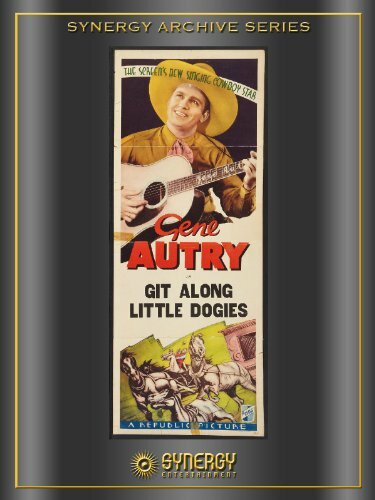 Even if you're a big Gene Autry fan, I think you'd have to call into question his behavior in this picture. He shoots the tire of a car driven by Doris Maxwell (Judith Allen), smashes another car window with a rock over a disagreement with the driver, and later lies about Banker Maxwell's suicide so it doesn't tarnish the man's reputation. Not to mention walking Champion into a restaurant to avoid his saddle being taken again. You could argue that in each of these events Gene was provoked in one way or another, but his response didn't exactly conform to that of your typical Western hero. I'm just saying. And if he were a politician, he would have been accused of flip-flopping on the oil well issue his neighboring ranchers were fully against because of it's tainting of the water supply. Gene figured the economic benefit of a railroad branch proposed for Canyon City would have trumped the problem of poisoned water. I don't think the writers really thought through their story plot with this one, because it really leaves Gene's character in a bad light. But somehow he manages to come through the picture a hero, even hooking up with his antagonistic leading lady by the time it's all over. Along the way, sidekick Frog Millhouse (Smiley Burnette) works a butterfly net gimmick in addition to his usual musical chores. There's an impromptu performance at Sing Low's (Willie Fung) restaurant with the Maple City Four on makeshift instruments, and a karaoke style sing along later on in the story. That was something I haven't seen before in an old Western, as the words of some common old standards flashed on the screen for the viewer to follow.